The internet is an inherently strange place. I mean, the fact we call it a place at all shows how we lack the vocabulary to really express what it is. And in this space (here we are again), strange things happen. 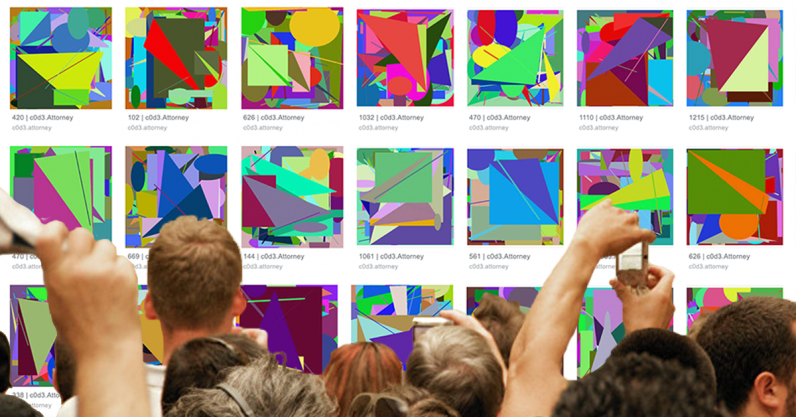 Like when you type two-strings of random four letter words into an image search and Google shows you a bizarre collection of connected art. This bizarre occurrence was spotted by Reddit user Yanekke and shared on the social networking site. If you’re dubious, give it a try yourself. Head over to Google Images and type two strings of random four-letter words, like “fjdu apld,” “ysjr plfe,” or “qxpd shdi.” More likely than not, you’ll be confronted by some art that looks very similar to the above. Occasionally a string will bring up something different, but this is normally because it’s a word that’s already in existence. I think we can all agree this whole thing is very… odd. Thankfully, there are some rather intrepid and intelligent folks on the internet. Take a bow, Reddit user ylph. If you replace the number after “m=” at the end of the address, the script will show you a different picture. Give it a try. Regarding how it works, ylph had this to say: “It’s probably some kind of hashing function, the output of which is then interpreted as parameters for a bunch of geometric shapes.” They did eventually admit their explanation might not necessarily be correct though. How are they appearing on Google Image search then? My opinion is this: the pages the images appear on contain random strings of text, Google then indexed those pages, meaning when you search gibberish, it pulls up these pictures. But, I wasn’t keen to run with this story without speaking to Google. So I did. The first thing a spokesperson told me was these images appearing were not any sort of Easter Egg. Nor does Google have any affiliation with c0d3.attorney. The company then told me its web crawlers index public internet pages and, when a user searches on Google Images, it will return results that contain images alongside the words in the query. Basically, and as I suspected, the pages on c0d3.attorney contain a lot of strings of random letters that match the search queries. Pretty boring stuff there, Google. Right… so what is this website? To give you some more information about Malboge, it is indeed is a programming language. And it was was invented in 1998 by Ben Olmstead. So c0d3.attorney is telling the truth there. For a fact that isn’t on the site, the language was named after the eighth circle of hell in Dante’s Inferno. Oh, and it’s basically impossible to use. Olmstead created Malboge to be deliberately difficult and cumbersome to code, making it part of the esoteric programming language lineage. Whatever else you think, the phrase “weaknesses in the design have been found” sends tingles down my spine. Such mystery. What’s the point of this site then? Well, no one really knows. There’s no information about who created it and there are no connections to any other sites. When I tried a simple Whois look-up, I’m told that “WHOIS data currently unavailable” – a result has become common since GDPR forced many of these records to be anonymized. I then did a reverse IP lookup to see if there were any clues there. Unfortunately, it appears to be a shared server, as it included hundreds, if not thousands, of domains. This meant we couldn’t draw any specific clues to who is behind the site. For all intents and purposes, c0d3.attorney is an odd internet island. People have tried to find out. The folks over at Esoteric Codes did a deep dive into the site, which is well worth a read. The author goes through a range of theories, including it being an art project, the possibility it’s a Bitcoin hunt, as well as it meaning absolutely nothing. They also point out the gibberish on the site’s main page isn’t actually a Malboge program. What an enigma. In a peculiar way, I enjoy this mystery. I don’t want to know why c0d3.attorney was created. Think of it this way, the truth is probably boring, while the conundrum is compelling. It reminds me of the old days of the internet, when weirdness and oddity was everywhere. Things online might be unrecognizable from a decade ago, but I’m pleased strange corners like this still exist and persist. Thank you, internet gods.